Knowing which shot to take on a whitetail deer or mule deer and when to take it will make you a more ethical and successful deer hunter. Even more important is knowing when to pass and not take the shot at all. The following tips will help you in making accurate and humane decisions on which shots to take and which ones not to when deer hunting. It can be very tough to make a good shot decision when your adrenaline levels are going off the charts. Sometimes the window of shooting opportunity while deer hunting is very brief and knowing when to shoot and when not to shoot ahead of time will hasten your ability to make the right choices when time is at a minimum. The Golden Rule of hunting that all sportsmen should know is to be sure of your target and beyond; in other words, you must know and be sure what is beyond or past your target before shooting to ensure the safety of other hunters as well as other game and property. A bullet, as well as an arrow, can have a devastating effect well after passing through or missing your intended target. Always consider this before taking any shot at whitetail deer or mule deer and make no exceptions. The following examples contain different scenarios and shot opportunities that you should expect to encounter while bowhunting or rifle hunting, as well as the factors that you will have to analyze when considering deer shot selection and deer shot placement on whietail deer and mule deer. This deer shot is too risky on whitetail and mule deer. Yes, you can kill a deer by taking a frontal deer shot with a bow, but the odds are against you. The chances of hitting the rib cage bone and deflecting or stopping your arrow far outweigh the odds of your broadhead taking out enough vitals for a quick and humane kill. This is a deer shot to pass on until the animal turns broadside for a more effective and ethical killing shot. You can take this deer shot with a firearm but the effective target area is much narrower than the width of the deer and the deer shot must be dead on for a quick and humane kill. A few inches either side of dead center will result in a frontal shoulder deer shot and will more than likely require a second shot. A little low on the deer shot and you will hit the deer in the meaty, lower brisket, resulting in a wounded animal. A whitetail deer or mule deer can be taken by a straight down shot but this is a marginal shot at best. The best case scenario on a straight down shot when deer hunting is to hit the spine, or one lung. This, however, requires perfect deer shot placement and the target area is very small and very unforgiving of shot error. The straight down deer shot can also make for a difficult tracking job if there is no exit wound, as the entrance wound will be extremely high. Also, a single-lung shot whitetail deer or mule deer can travel for a long distance before expiring. When deer hunting it is best to wait until the animal passes a short distance and turns for a better angled shot into the vitals. This shot is humorously referred to as the "Texas Heart Shot"...however there is nothing funny about taking this shot when deer hunting. It is an irresponsible shot that should never be taken with a firearm or bow. Yes, there are stories of deer hunters taking whitetails and mule deer with this shot by severing the femoral artery and the animal drops quickly after the shot, but the normal outcome for this shot is wounding the animal with a small chance for a quick recovery. You should always pass on this shot and so should any ethical deer hunter. Quartering away deer shots with both archery equipment as well as firearms are excellent opportunities for taking whitetail deer and mule deer in a quick and humane manner. This is a deer shot of angles. You should angle your shot so it enters in a straight line towards the opposite front leg of the side you're shooting on. Many deer hunters refer to this as "aiming for the exit hole". When done right this shot will hit the vitals and dispatch the whitetail deer or mule deer cleanly and quickly. However, be careful not to place the shot too far forward. At this angle you may only catch one lung and make for a more difficult recovery as opposed to cleanly hitting both lungs. This shot angle is a little more forgiving than other angles, allowing some room for error if your shot is a little farther back than you had aimed for. As your projectile moves forward in its course it stills has a good chance of hitting vitals (i.e. one opposite lung, a liver...) before it exits the opposite side, even though its entry would ideally have been forward a few inches to contact both lungs and/or a heart. A bowhunter should never, under any circumstances, shoot at an animal that is quartering, or angled, towards them. This is an extremely low percentage deer shot as the vitals are protected by the front leg and shoulder. Placing an arrow in front of the shoulder on a whitetail deer or mule deer at this angle will most likely result in a wounded animal with the best case scenario being a single-lung hit with a moderate to difficult recovery. Placing an arrow behind the shoulder may result in a single lung and liver hit at best, while quit often resulting in a paunch shot animal and making for a lengthy and difficult recovery. The firearms hunter can take a quartering toward shot and break the front leg and shoulder, resulting in a clean and effective kill. However, it must be stressed that this is not a preferred shot when deer hunting. Always try to wait for a broadside or quartering away shot which result in a much larger target and unobstructed view of the whitetail and mule deer's vitals. This is the deer shot that every deer hunter hopes for. A whitetail deer or mule deer standing with an unobstructed broadside view is as good as it gets when it comes to a perfect deer shot opportunity. Make sure the deer is in range and center your shot just behind the front leg and below the shoulder. Many deer hunters prefer a heart shot, while others feel that a center lung shot just a few inches further behind the shoulder (rather than right behind the shoulder) presents better odds for a clean kill. The reasoning for this is that you have more room for error with the larger kill zone of the lungs, which extends a third of the way back on a whitetail deer. This lung shot allows you to keep a little further away from the shoulder bone and blade that can stop or deflect your arrow should you hit a little further forward than you had planned. A direct, double lung hit with no heart contact will dispatch the animal as quickly, and in many cases even more quickly, than a true heart shot with smaller lung contact. Either deer shot will humanely dispatch the animal and wastes very little meat in the process. 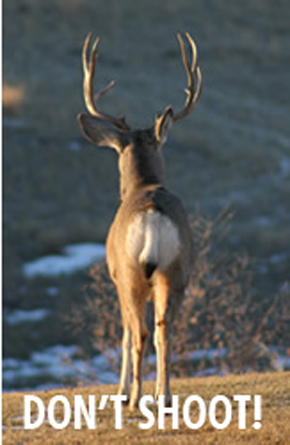 Consider a whitetail deer or mule deer that is facing to your left. If the deer shot is a bit high it still takes out the lungs or hits the spine. If your deer shot is low it takes out the heart. If it is to the left it may break the shoulder and penetrate into the lungs, and if it is a bit to the right it takes part of the lung and liver. This is the deer shot that every ethical deer hunter should strive for. The bowhunter should always avoid hitting the shoulder while the firearms hunter will break the animal down quickly if he hits the shoulder, however, there will be some deer meat loss. Now let’s discuss some less talked about deer shot opportunities and judgment calls that you may encounter while afield in pursuit of your whitetail deer and mule deer. Although you may never find yourself in some of these deer hunting situations, you can be assured that the longer you deer hunt and the more time you spend pursuing your species of choice throughout your deer hunting endeavors, the better the odds are that you that you will encounter some if not all of these situations. The following scenarios may help you become more aware of and familiar with the situation should it arise.